In 1971, high-school chums Keith Barr and Terry Sherwood opened an audio-repair business in New York, and after fixing their fair share of busted pedals, reckoned they could do a better job. 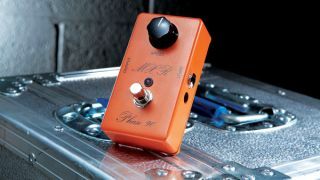 A few years later, MXR Innovations was born, and the Phase 90 was the company's first stompbox out of the door. "David Gilmour, Jimmy Page, and most famously of all, Eddie Van Halen made it a pedalboard staple"
Guitarists loved its thick harmonic-laden sweeps and one-knob operation, and it wasn't long before David Gilmour, Jimmy Page, and most famously of all, Eddie Van Halen made it a pedalboard staple. Early Phase 90s bear the company's classy script logo, and remain the most desirable for tonehounds, who swear they sound better than the latter-day block-logo 90s, which featured a number of component changes. MXR went bust in 1984, but Dunlop picked up production in the late-80s, relaunching the block-logo Phase 90 for a new generation. While recent years have seen the company revive the script logo - along with '74 Vintage plus Zakk Wylde and EVH signature versions - you can't go wrong with any of MXR's orange wonders: the Phase 90 is still the benchmark for classic swirl. The Phase 90 launches the MXR brand in New York. MXR's distinctive script label is replaced by the block logo version. Jim Dunlop buys the MXR brand, following the dissolution of the company in 1984. The '74 Vintage Phase 90 is introduced, complete with original-spec components.